What Was Wrong With Traditional Halloween? A few weeks ago I chanced to see a book and figure about a Halloween witch. This witch, you see, needs your candy. If you don’t give her the candy you trick or treated for, her pet will die. Or her broomsticks need it for energy. Or something. I saw a couple different kinds. I’m not even linking to it because there’s more than one witch thing on the market and it doesn’t need publicity, does it? Like Elf on the Shelf, this proudly proclaimed on the packaging to be a “tradition.” Never mind that a tradition isn’t a tradition until it’s been done for years (Tradition definition: “the transmission of customs or beliefs from generation to generation, or the fact of being passed on in this way”). But obviously “tradition” is a great marketing keyword that makes you part with money. Because in return for the candy, the parent is apparently obligated to leave money or a toy. Before the advent of this witch marketing thing, I’d heard of parents telling their kids about a witch fairy, a sort of tooth fairy, who would leave them $20 in return for candy. Which led to my kids coming home and saying, “How come I didn’t get $20 for my candy?” Which then led me to explaining that those kids were tricked. That’s me, no parent-parent loyalty. Anyway, let me break this down for you. You spend $50 on candy to give out. You spend generally $25-35 on a costume for your kid. More money for Halloween carnivals and haunted houses and everything. And then you take your kid for 4 hours with their pillowcase to trick or treat and then…you make them give it all up? And then you pay MORE for the privilege by buying a toy or giving the kid money? (shakes head) America. What would your greatest generation grandparents or great-grandparents say about this? My father tells me that in his coal mining town of Nemacolin, PA, in the 1930s, he and his sisters would trick-or-treat for weeks, like into November They didn’t know any better and they were poor and their father had lost his leg coal mining, and obviously the neighbors felt kinda bad for them so they gave them treats through the whole month. And here we are, tricking kids into giving us their candy. Believe it or not, generations of kids have pigged out on Halloween candy and come out unscathed. For me, it was the one time we could. If you’re worried about your kid being overweight as a result of Halloween candy, then make them walk the dog more or go running with them or something. Once a year is not going to harm them. And as the parent of not-young-kids, this has worked out fine. My eldest (despite having consumed non-organic foods and loads of Flaming Hot Cheetos, watching SpongeBob, and eating all the Halloween chocolate she likes) is graduating in the top 15% of the state, a year early. She has played water polo and founded and run a club. She remembers to do her chores. She is her own person. So she is pretty much my proof in the pudding (though honestly, she is just who she is anyway so I’m not actually taking much credit). And, like I said, an average kid will only pig out to the point of being sick once. If you want to do something with extra Halloween candy, look into a troop donation program. 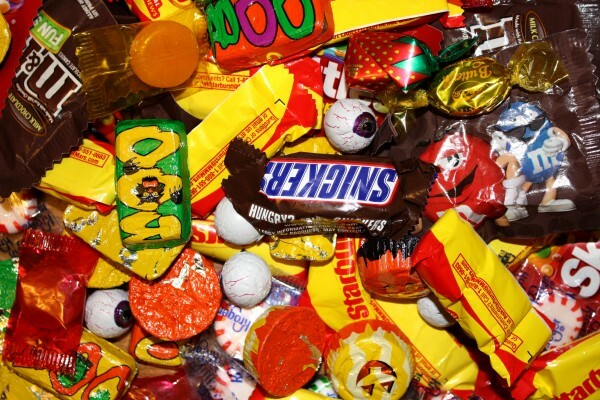 Our school collects candy for the military, who, by virtue of spending 8 hours a day or more involved in physical activity, can easily consume all those extra calories. But why pay for a “tradition” that actually involves MORE work than just telling your kid to not eat all that candy at once? Why not just say, “We’re trick or treating two blocks, and that’s it.” Problem solved. Less work. Less money. Put the money for the Halloween witch into your holiday savings account or buy yourself some chocolate. Otherwise the ghosts of your ancestors will rise up from their graves and slap you in the face.